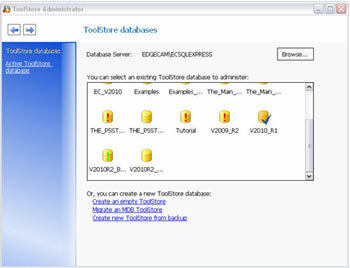 The ToolStore Administrator application is used to manage your ToolStore databases. It allows you to create new databases and backup, restore, and delete existing databases. The ToolStore databases can be stored on your local machine or hosted on a server, for access by client Edgecam machines. 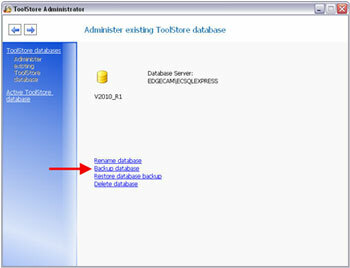 You can also use ToolStore Administrator to switch the active database. To copy a database to another installation (a colleague’s PC or a database-hosting server installation for example), you use ToolStore Administrator to create a backup of the database and then create a new ToolStore from this backup. There can be a number of databases, but you only use one of these at any one time – this is the ‘active’ database. The currently active database is indicated by a blue tick. To change the active database, you follow the hyperlink in the top left of the dialog. Older databases that need to be upgraded before use in the current version of Edgecam are indicated by a red exclamation mark. When working in an older version of Edgecam, some databases may have a green exclamation mark. This indicates that the database is from a newer version of ToolStore and cannot be used. For backing up your ToolStore databases, use Windows Start Menu ► All Programs ► Edgecam ► ToolStore Administrator . In the ToolStore Administrator, select ToolStore databases on the left. Search the database for which ToolStore you wish to backup and left click on it. Once you select the ToolStore, the next window will allow you to backup the database. Select Backup Database, browse for a backup destination, give the database a file name and select the Backup button. There are several ways of creating a new database, such as creating a new database from backup or an empty ToolStore.